A story that follows an aspiring actor who can't catch a lucky break on the road to becoming a star. Yin Tianchou (Stephen Chow) has always been hellbent on becoming an actor. Aside from playing extras, he also heads up a training class at the neighborhood welfare association. At this time, Liu Piaopiao (Cecilia Cheung) accompanied by her mom enrolls for acting classes. Liu Piaopiao had a very bad experience in the past but she gradually comes out of her shell through Tianchou's guidance and falls for him. After many setbacks, Yin Tianchou's efforts finally pay off when he gains the approval of a big star named Juan Jie (Karen Mok). She helps him land the leading role in a new project, but things do not work out. Meanwhile, an undercover cop (Ng Man-tat) joins the crew to investigate a case. It was the top grossing movie in Hong Kong in 1999. Jackie Chan makes a cameo. It is the first time that Jackie Chan and Stephen Chow worked together. At the time, Jackie Chan was filming the 1999 movie Gorgeous. Both agreed to make cameos in each other's movies. Stephen Chow casted Cecilia Cheung as the leading lady. It was her first movie on the silver screen and breakout role. She was nominated for Best New Performer at the 19th Hong Kong Film Awards. 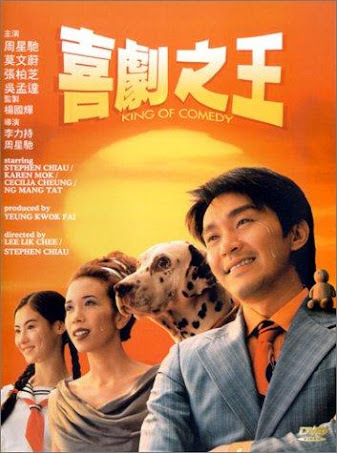 Because Stephen Chow wanted to show the story of ordinary characters, it included many of Stephen Chow's own experiences early in his career. Jazz Lam bested 1000 applicants who answered Stephen Chow's open casting call for the movie in 1998. Let us know why you like King of Comedy in the comments section. Please also share these fun facts using the social media buttons below.